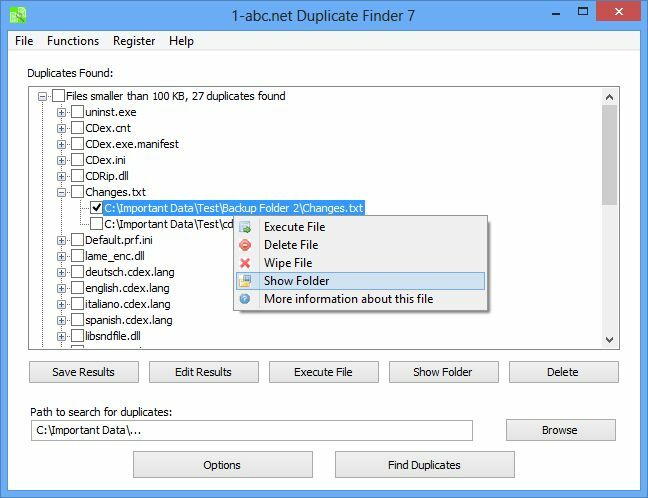 1-abc.net Duplicate Finder - Find identical files on your computer or on external drives! Find identical files on your computer or on external drives! In times where thousands of files are located on a computer, sometimes it is very hard to maintain an observation. This very easy to use program helps you to detect duplicate files on your machine, on external hard drives, on CDs, DVDs, USB sticks and camera cards. Since each user defines duplicate files different concerning file name, file size, attributes, last modification time and so on you can determine by yourself what the program should look for. It is also possible to compare unique CRC32 checksums of each file. After the selection of any path or drive you like the program checks all files in all folders and subfolders and compares them with each other, so definitely no duplicate file will be forgotten. When the search is done, you will see a list where the found duplicate files are categorized concerning their file size to make it even easier. Now you can select any of it and decide if you like to execute it, to delete it or to take a view to the folder where this file is located. 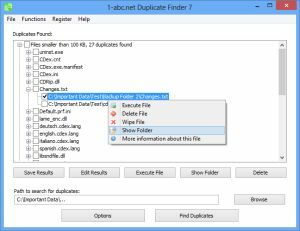 Duplicate files on your computer – with 1-abc.net Duplicate Finder you will never have to care about them anymore! Program can also read from SD cards, USB sticks, external drives etc.